The washing machine broke, but I fixed it! We have so many labor-saving devices today that we go broke keeping them repaired. Everything is easier, but requires greater maintenance. As much as my earlier tale of dishwasher repair is one of frustration and expense, this is a story of success and frugality. While I was away (why does everything go wrong when I'm on the road? ), the washing machine started to leak. I did the laundry earlier this week and it didn't leak a lot, but it leaked too much to ignore. I checked all the external hoses and concluded it was something inside. I didn't figure there'd be any user-serviceable parts in there, at least not serviceable by this user, so I called the plumber we've used in the past, W. S. Pickering, and he was honest: he doesn't really repair Amana appliances, he could come take a look, but it sounded like the tub seal was leaking and he really couldn't fix that. Fair enough. So next I called the repair center of the place where we bought the appliance. Or rather, the company to whom they've out-serviced all their repair work. For $85 they'll come to the house: parts and labor extra. Surely, Deb assured me, we could do better. The yellow pages (yeah, the printed thing on the bookshelf, not the web, go figure) lead me to Gauger's Appliance Repair. He, too, was honest. It sounded, he said, like the tub seal was leaking, and he couldn't fix that. In fact, if the tub seal was leaking, it was time for a new washing machine. (Insert previous rant about our disposable society here.) But he told me how to check. 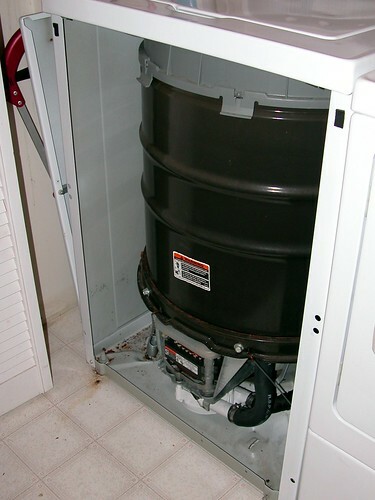 Unscrew the front panel, run the washer, and look for leaks around the seal where the spindle goes through the bottom of the tub. I did as instructed and watched the tub seal. No leak. The pump had been another suggestion so I looked at that, poking sort of randomly about. And there it was, a little stream of water coming out of the drain hose. The drain hose had been threaded through the case such that it pressed against one of the tub supports. Forces being what they are (equal and opposite), the tub supports move a little bit each time the tub oscillates. 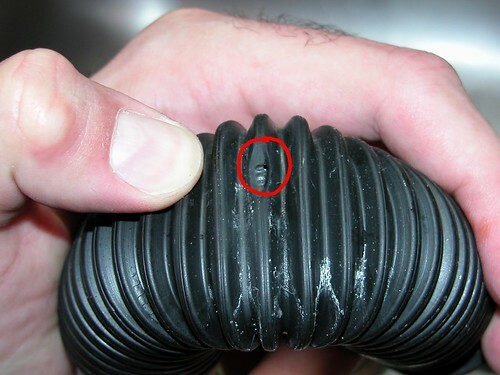 Over time, friction had worn a tiny hole in the drain hose. 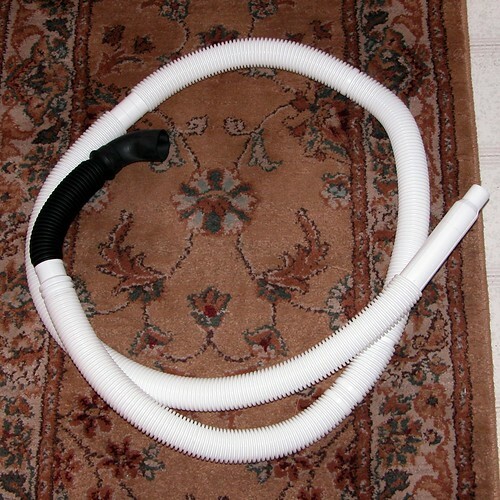 Maytag was happy to sell me a replacement hose for $13.49 and I ordered it yesterday. I opted not to pay $20.00 for next day shipping, I figured I could wait a week if I had to. Imagine my surprise when UPS delivered the new hose today. There's $20.00 well saved. 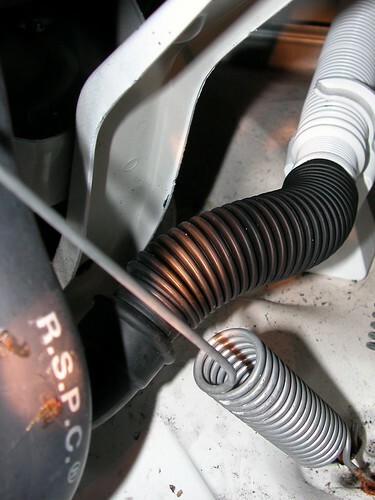 Now there's plenty of clearance between the hose and the supports. And the whole repair took maybe half an hour. Sweet! Great information. I did the same check and found the exact same situation. We had a repairman out today and he diagnosed a hole or crack in the tub. Looks like it's leaking right around the hose. The machine is only a year and a half so I was dismayed that it was going out so soon. Thanks for the info, probably saved me big bucks. We'll see soon enough. I'll blog about it later at http://thoughtsparks.blogspot.com. Thank you for sharing your experience. It helps me understand how to look for the source of the leak in my washing machine! The hose was easy to replace, just a couple of screw clamps, one on each end. 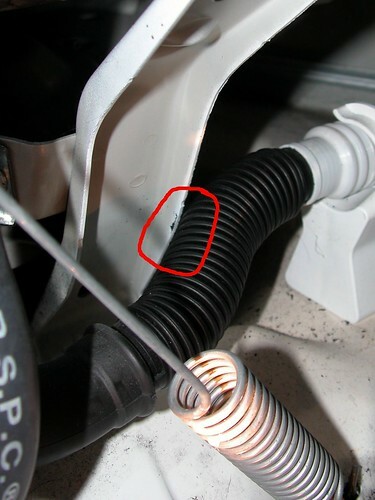 Does anyone know what might cause oil to leak from underneath a washing machine? The washing machine is dripping water. It is coming from under the lid where the water comes in when the cycle starts. I have turned the supply hoses off and the dripping continues. It is Estate by Whirlpool. Can I fix this myself or do I have to call a repairman? Thank you for your help.